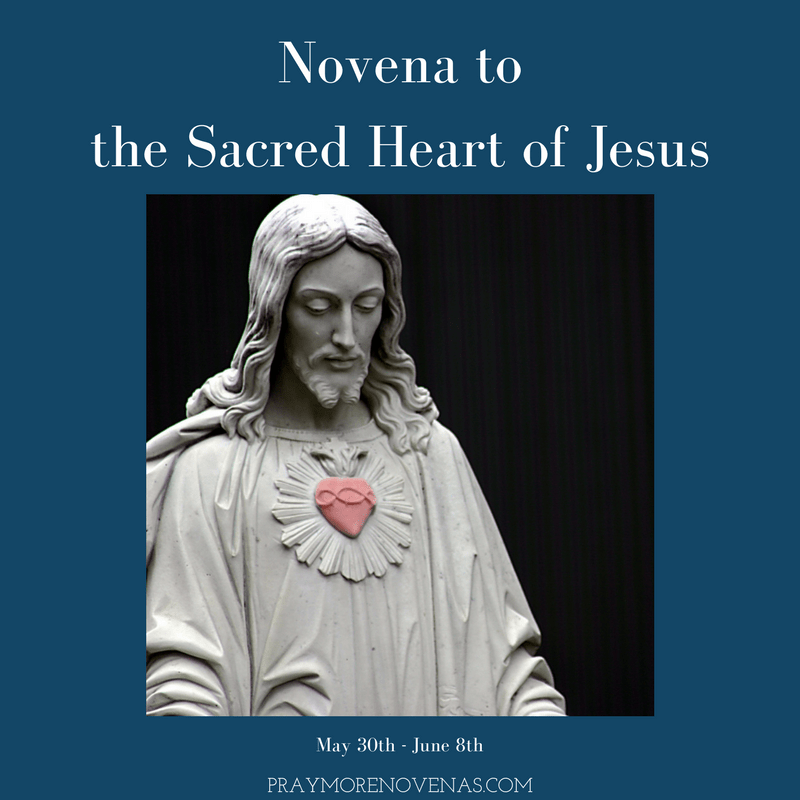 Here’s Day 9 of The Sacred Heart of Jesus Novena! In thanksgiving for my Sacred Heart of Jesus Novena intention as it was answered. My daughter and son-in-law were able to sell their home at a fair place and in a very timely manner. Thank you dear Sacred Heart of Jesus for this intention and for my many blessings. I pray that my oldest son will be reunited with his ex-girlfriend, the love of his life. He needs happiness in his life and help with depression. He needs a job close to his friends and family. I pray that my daughter is safe and happy. I pray that my youngest son achieves a normal physical height so he won’t be picked on as he has been. I pray for peace for my mother, my brothers, and myself as we deal with the recent loss of our anchor, my father. I pray this in the name of Jesus. Amen. After years of praying for a job that would allow me to cover my monthly bills. Finally. Thank you Jesus, Mary and all the Saints. Thank you God. Grant him peace and stop him from cursing. I also pray for April and her partner. Heal them from their sickness of homosexuality. Let them meet a devout catholic who would fill them with the love of Christ, change their hearts. I pray for Sacha. Let him meet a devout catholic young lady to lead him to faith and to change his life and also be a role model for his daughter. She has no one to look up to and is confused . She needs guidance and true love. Heal her Lord from her mental illness. Help her and the whole family to find healing in your love and your grace. Make me love you more and more, and make me desire you every moment of the day and give me the grace of prayer. If it’s your will cure me from this debilitating sickness that I have. Bless us all includung my extended family. I place all these petition in your sacred heart and beg for your mercy. I love you and I bless you Lord. I trust your sacred heart which is full of love and mercy. Amen. Our great grand- daughter (2 yrs) was born severely handicapped. They said that if she walked it would be with braces and a walker. God is good!! She now walks by herself with NO braces or a walker!!! Now, WHEN God is ready, she will gain the use of her arms. These Novenas are the reason God is blessing her and us!! Thank you!!! Dear Sacred heart of Jesus, thankyou for your blessings in my study- and hobbylife. Please make me strong so I can succeed with my intentions to come closer to my father and my two halfsisters. My stepmother is very hostile and jealous but I need to come closer to my father and siblings because I am very lonely and have no other close relatives. Please God make the heart of my stepmother soft, just a little bit softer. I also pray for the family of my mother that are full of criminals and that have caused me a lot of suffering during many years. Please Jesus heal them. Finally help my husband with his serious identity problems and please help him to build a relation with his only sister. They have not had contact since the burial of their father many years ago, My sister-in-law has problems with her nerves and suffer from paranoia. Please Jesus, for you nothing is impossible, help me and these persons around me. Amen. Sacred heart of Jesus, I pray for my homosexual son, grandson, their partners, and all those in this lifestyle. For my husband and myself going through this pain, for grace. I pray that LD and CD will now have a strong and holy marriage and they will return and join a Catholic Church/Faith now. Please let workman’s comp pay for my sister’s needed surgery. All this I ask through Jesus by the Power of the Holy Spirit! Sacred heart of Jesus thanks for being with us through another Novena to your Sacre heart. Grant us all our prayer intentions please COMMAND the Inner demons to flee from my head and anoint me bountifully with the Holy Spirit and Godliness to do and think just what is right and holy all the time in your merciful name I pray with thanksgiving. Amen! O sacred heart of jesus pray for me to be strong in faith. Please keep me healthy and strong and bless all my family and help with problems with both mine and Keith’s family. In the name of the father.Amen. I pray for all over the world help us that we have hla heart like ypurs. In Jesus’s name I pray Amen. I ask our Lord for a complete healing of my back and leg. Pain from disc problems. Jesus says ask in my name and it shall be done. I place my trust In you Lord for you are the healer of all. I love you and praise your holy name. Amen ? Please pray for my husband. He was diagnosed in March with metastatic non small lung cancer. The medication he is taking is taking a toll. He is having a CT scan today and I am asking our Father for good results. We appreciate your prayers during this difficult time. I pray for the conversion of RObbie and Gwen and Laura. I pray also for their healing from surgery and addiction. Lord Jesus I place my financial needs into your hands. Dear Lord I pray for money to finance my son throughout medical school. I pray for money to pay my son’s tuition fees and to meet all his financial obligations.My son desire is to become a doctor please be at his side,guide him and protect him as he persue his dreams. I pray for my daughter. Please bless her.i pray that my children would be successful with their studies. I pray for husband please keep him safe.i pray for my family.Sacred heart of Jesus I place all my prayers into your hands. Please pray for 24 yr old niece Becca who has cancer and my nephew who also is very sick. Thank you. Dear Sacred Heart of Jesus I’m still continue praying for my results of my Nursing examination last June 3and 4…Sacred Heart of Jesus please fulfilled my dreams to be the topnochers with the average of 88?Sacred heart of Jesus please send me your angel to protect me and give me more strength especially now I’m waiting for the result of my nursing board examination I got a severe anxiety and severe nervousness..I can’t sleep well and eat well ..In Jesus name I trust in you. I claim the blood of Our Lord Jesus Christ on me.